We always said it was a game changer, and now we have the proof: the TriAmp Mark 3 was awarded the 2015 MIPA (Musikmesse International Press Award) for Best Guitar Amplifier at musikmesse in Frankfurt last week! The MIPA Awards are voted on by more than 100 of the leading music magazines from across the world, and TriAmp Mark 3 had to beat off serious competition from Fender and Mesa/Boogie to secure the prize. 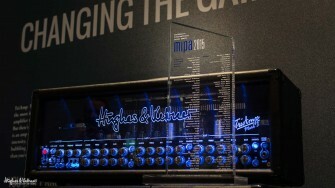 Rüdiger Forse, Hughes & Kettner’s Senior Product Manager, who picked up the award, said: “Back in January, I was asked by a Japanese magazine during an interview: What do you think is the most important thing in making amps? “The expected answer was probably something like: great tone, innovative technology, or German engineering. But I said: the most important thing in making amps is the same thing that’s most important in making music. It’s… inspiration! “Of course, great tone is important. More than this: it’s essential. And innovative technology is important too! It helps to make great tone accessible. But you cannot engineer inspiration! Even German engineers cannot do this! “Inspiration is something that happens … it happens in the guitar player’s mind. It happens when you get inspired to play, when you get inspired to explore your skills, to cross tonal borders, and to expand your creative expression. Or in short: when tonal freedom inspires you to make great music!